New Year’s Eve in Seattle, watching the fireworks at the Space Needle, is the most incredible and easily the coolest New Year’s Eve I have ever experienced. The show is spectacular, the crowd is always energized, and it’s the best way to ring in a New Year. 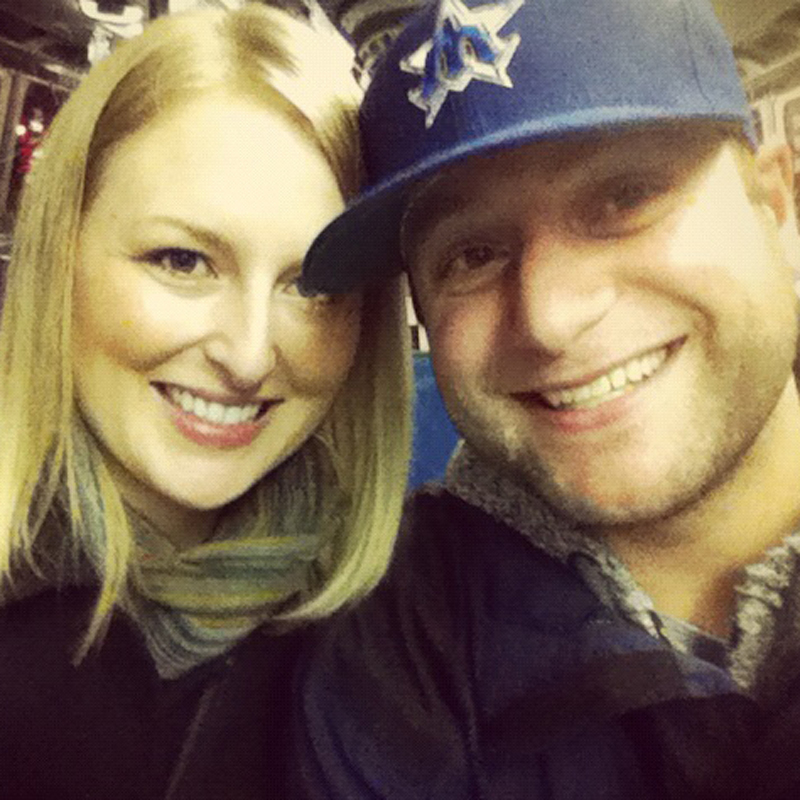 Ringing in 2014 at the Seattle Space Needle. 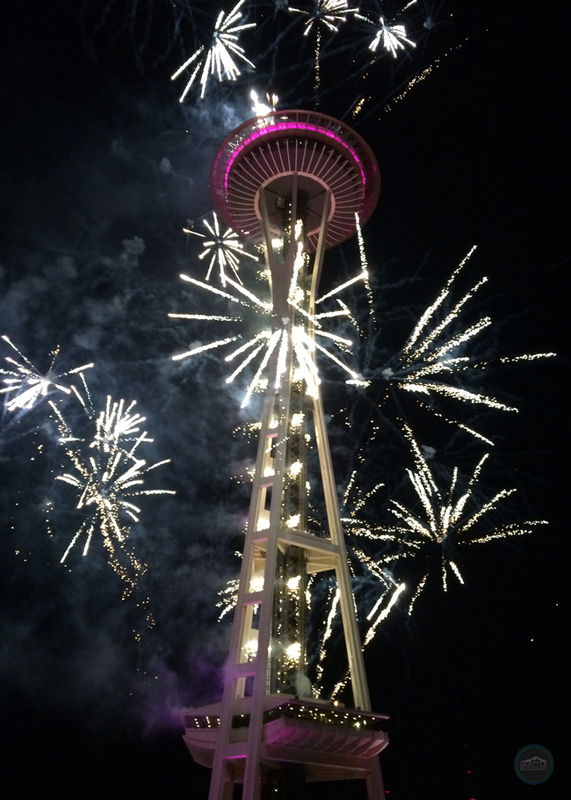 The firework show at the Space Needle on New Year’s Eve is a sight not to be missed. Tim and I are fortunate enough to get front row seats on the rooftop of a neighboring building (Tim’s hookup, not mine). The fireworks start just before midnight. The first few fireworks are actually a ten-second countdown to the New Year. This was actually a little bit confusing for us the first time we spent New Year’s Eve at the Space Needle. We didn’t realize the start of the fireworks signaled the countdown until a few seconds after it struck 12 o’clock. It wasn’t a huge deal missing the actual moment the new year kicked off as the show that followed was amazing. 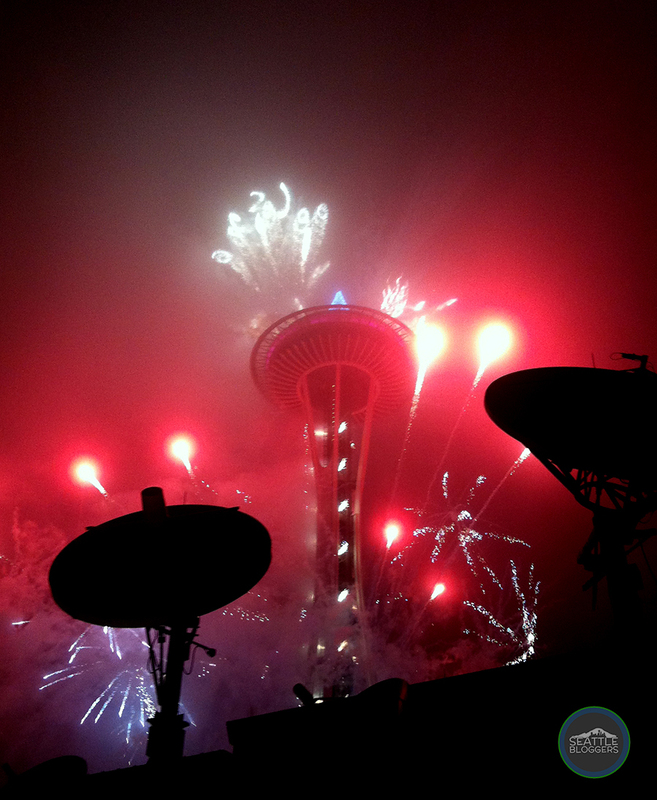 The Seattle Space Needle fireworks show during the New Years’ Eve celebration ringing in 2014. The fireworks last about ten minutes. I am not an expert on the different types of fireworks, but there is always a great variety. Some go straight out from the Space Needle, others make star shapes, or explode in spirals. There is also lots and lots of color. While not everyone has access to the rooftop of a nearby building like we do, there are still plenty of other spots to watch the fireworks show at the Space Needle. The streets surrounding the Space Needle are shut down and people flood the streets. You can also snag a spot on the grass at Seattle Center. I’d recommend bringing a blanket and/or lawn chair. It’s also a good idea to dress warm and to come early. Fireworks at the Space Needle on New Year’s Eve 2012 in Seattle. Traffic gets really backed up around the Space Needle the closer to midnight it gets. If you’d like to watch the show but don’t want to deal with a much traffic and people, we recommend heading to another vantage point where you can see the Space Needle, including Kerry Park, Ward Springs Park, Ursula Judkins Viewpoint, or Gas Works Park. The best part of the fireworks show at the Space Needle is watching Seattle’s most iconic landmark look so beautiful at night with all the pops of color. It’s hard to put into words what that felt like to watch. I love Seattle. It is my home and the Space Needle is a symbol of that for me. Seeing it all dressed up in fireworks is breathtaking. There are always certain points during the show that Tim and I both blurt out, “WOW!” It’s also really loud! So loud that car alarms in the area of the Space Needle sometimes go off. 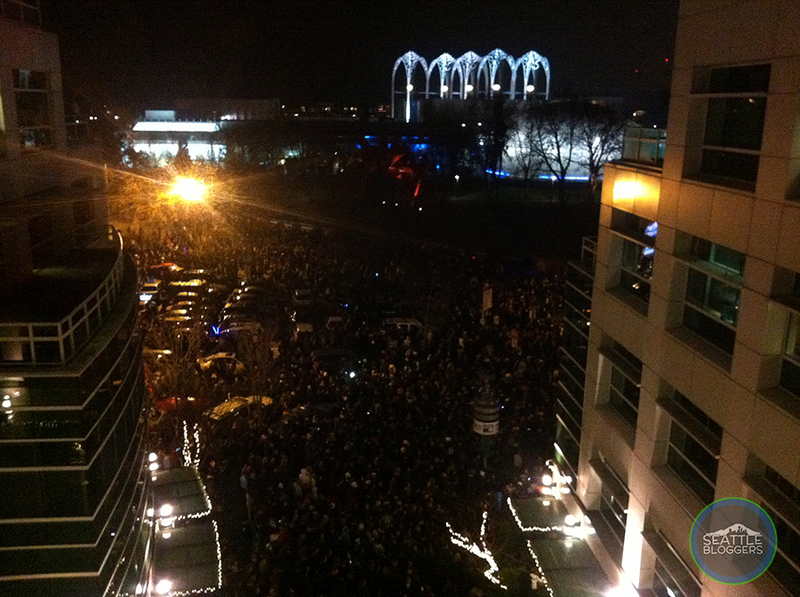 The New Year’s Eve crowd at the Space Needle ringing in 2014. I like the concept of New Year’s Eve. To me it means reflecting and celebrating the previous year, being thankful for what you have and a time to think about all the lessons learned. I love the idea of saying cheers to the future and I also like the whole resolution part of the holiday. With all that said, I’ve never been big into celebrating the holiday. Sure, I’ve gone out with friends, attended parties and have always stayed up until midnight. But it has never been a holiday that I make plans months and months in advanced and spend a lot of time getting excited about. For someone who would prefer to spend New Year’s Eve at home or out to dinner with a few close friends or family, watching the fireworks at the Space Needle is perfect. The crowd waiting for the Space Needle fireworks on 2013 New Year’s Eve in downtown Seattle about an hour before midnight. But the Seattle Space Needle fireworks show is also perfect for people who like to paint the town red on New Year’s Eve and celebrate the coming year in a big way. Thousands of people packed the streets and the Seattle Center to watch the show. Some were families who brought blankets and lawn chairs to watch the show while others were decked out in sequins, party hats and streamers. There was this special buzz about the city of Seattle that night. It didn’t matter who you were or how you prefer to ring in the New Year, everyone is always having an awesome time and enjoying themselves. 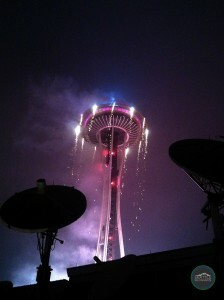 We’ll definitely spend New Year’s at the Space Needle again! When was your best New Year’s Eve celebration? Have you ever spent a New Year’s Eve watching the fireworks at the Seattle Space Needle? We’d love to hear from you! Leave a comment below or connect with us on Twitter, Facebook and Google+. Don’t forget to also check out Seattle Bloggers for more on great things to do in the city!